Gent Life is an online platform dedicated to fashion, travel and lifestyle with a focus on the way history has impacted those subjects. By combining modern content regarding trends and points of interest with historical figures and events, Gent Life has separated themselves from the typical men's fashion blogger with content containing a deeper meaning and inspiration. I created a brand identity and website platform so that Gent Life could expand from social media a native source. My goal was to mimic their approach by combining the old with the new and design a modern logo and website with old fashioned details like classic fonts and dapper accessories. I also mixed in some modern detail, like a hover feature on the website fading grayscale images to full color. This is a subtle nod to the timeless style and history presented via modern technology, bringing the past to 2017. Bespoke, vintage fashion and accessories are the subject of Gent Life's online presence. Therefore, I found it important to incorporate a classic icon and use a timeless typeface to demonstrate this aesthetic. 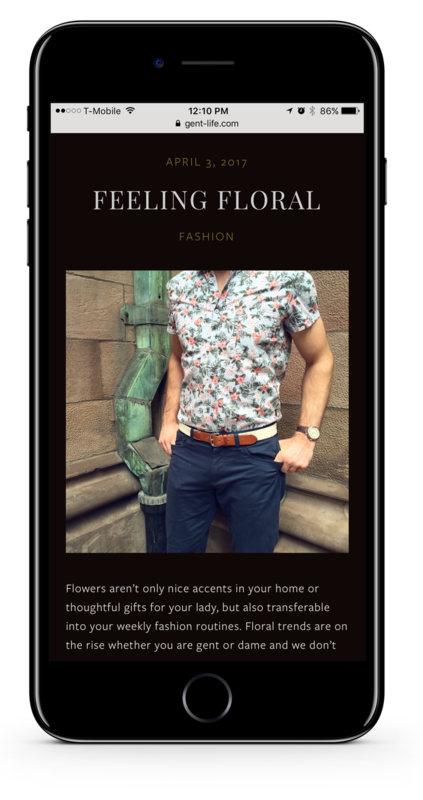 Gent Life's website is mainly used to share more in-depth content to expand on the items they share on Instagram and other social platforms. I felt it was important to utilize Gent Life's popular photography in the design, which is a single index page with parallax scrolling. I also designed the photos to appear fade from black & white to color on hover, symbolizing their efforts to bring old fashioned style to modern day life. As regular participants of Florida's many experiences and local events, it was important that Gent Life have business cards on hand to promote their platform.